Should Yorkies Eat Dry Dog Food or Wet Dog Food? How Much Dry Food Should You Feed Your Yorkie Daily? What's the Best Puppy Food for Yorkies? What is the Best Dog Food for Senior Yorkies? What is the Best Food for Teacup and Miniature Yorkies? Nutrition plays a major role in keeping your dog healthy for years to come. However, many people are unaware that breed and size are two factors they should be considering before picking up a bag of dog food. If you own a Yorkshire Terrier, chances are you are wondering what is the best dog food for Yorkies as it can often be difficult to satisfy both their taste buds and daily nutritional requirements. 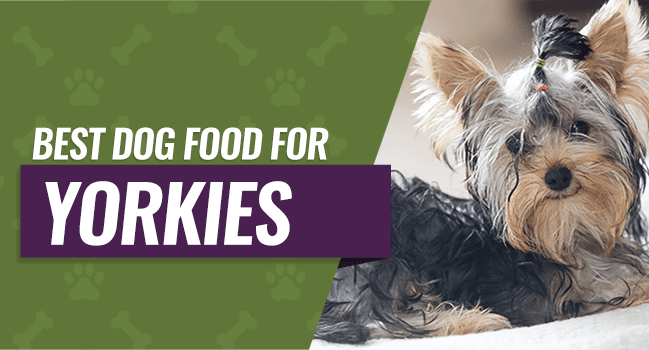 We curated a list of the top 5 best dog foods for Yorkshire Terriers in addition to producing a buyer's guide so you can be equipped with the tools to confidently select food for your small breed pup. Toy breeds, such as Yorkies, have both small stomachs along with tiny mouths. It is important to keep this in mind when purchasing dry food for your dog. The standard kibble size can often be too large for smaller breeds which is why there are dry foods specifically designed for toy breeds and small breeds. In such dry foods, the kibble is typically half the size of a standard kibble and can sometimes be softer so it can be chewed and digested easily. Due to their small stomachs, Yorkies cannot handle a large quantity of food at once. Thus, their meals need to be spread out throughout the day in smaller portions which can vary depending on their age. If your Yorkie is weaning, which can begin anywhere from 4 to 7 weeks and end around 3 months, it is critical that you make food readily available throughout the day. Providing additional food during the day will allow him to eat when he feels hungry reducing the risk of hypoglycemia, help him gain weight, and assist him in getting used to an eating regime that differentiates from milk. Once the weaning stage ends, which is typically around the third month, you can begin to create a feeding schedule with your pup as it will make it easier to begin potty training as well as improve your puppy's behavior. Until your puppy is one year old, it is advised that you feed him three to four small meals a day, which can be in the morning, afternoon, early evening, and evening, however, he should be feed at least two hours before he goes to sleep. If your Yorkie is an adult, one year or older, you can now begin feeding him one small meal and one larger meal instead of three or four meals a day. However, not all Yorkies can handle two meals a day so adjust accordingly. The caloric intake of your dog can vary depending on age and activity level, yet there is a recommended rule of thumb. Puppies: 200 calories per day are ideal as they are more energetic. Adults: 150 calories per day are recommended as they still burn calories throughout their day, but not as quickly as a puppy. Seniors: 120 calories per day are advised as they are more sedentary than adults and puppies, so they do not nearly as many calories. While we just discussed the important of how much and when you should be feeding your Yorkie, it is just as - if not more - crucial to know what your Yorkie should be consuming and why. Protein: Protein is necessary for your Yorkie's diet as it is a major source of energy as well as it keeps their immune system strong. A great protein source should come from the muscles of animals such as chicken, lamb, turkey, beef, and fish; it should not come from anywhere other than the muscles because that means it is likely processed which is not good for your Yorkie. Carbohydrates: While Yorkies can digest some carbohydrates, steer clear of dog foods that contain corn or soy as they are often hard on a Yorkie's stomach. Ingredients such as sweet potatoes and brown rice listed in high-quality foods are great sources of carbs that will be much kinder on your Yorkie's tummy. Fats: Healthy fats are a great way to maintain your Yorkie's overall health as well as give him a long, shiny coat. Fish oil is a great source of fat that can be found in high-quality foods and can even be drizzled on top of food for added benefits. The two most common types of dog food are dry and wet. While wet food does provide different benefits than dry, Yorkies should mainly eat a dry food diet as, like most small breeds, they have dental issues. Dry kibble naturally assists in cleaning their teeth of tartar and plaque because of its brittle texture. Keep in mind that Yorkies should be fed kibble that is small as they can easily chew it in their mouth and digest it. Feel free to use wet food as a supplement to your Yorkie's diet by mixing it together with dry kibble, but it is not necessary. There is not a one-size-fits-all answer to this question as every dog, even Yorkies, has specific needs that need to be met. A younger puppy will need to consume more calories in a day than an adult or a senior, however, an active adult may eat just as much as a puppy that is not as energetic. Ideally, a puppy should consume at least 45 to 55 calories per pound of body weight dailywhereas, adults should consume less per pound. However, not all dry foods have the same calories per measurement, so it is best to go off the serving sizes provided on the label. Typically, the dog food labels will list the serving size and calories so that you can ensure you are not underfeeding or overfeeding your Yorkie. Feed your Yorkie less if you are preparing his food yourself as food prepared at home tends to be more calorie packed and can result in overeating and weight gain. Smaller breeds are known for having major health problems. 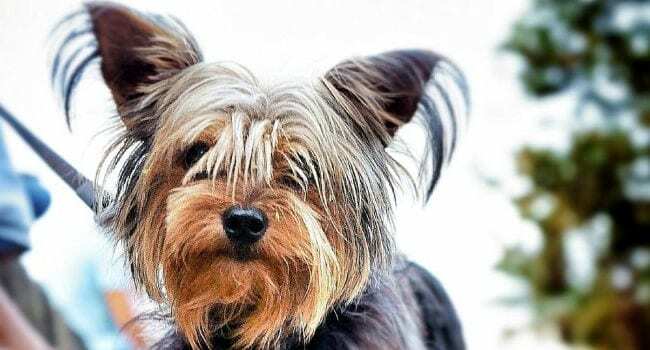 While most small dogs live healthy lives, Yorkshire Terriers are predisposed to certain ailments that you should be aware so that you can seek proper medical attention in the event that one of these issues arises. This occurs when the trachea's cartilage rings cave in making it hard for air to pass through the windpipe. While the cause is unknown, some signs of this condition include a barking cough, shortness of breath, and the gums appearing a bluish color. Because Yorkies' have incredibly sensitive teeth, tartar and plaque build up can easily result in premature tooth decay and gum infections. Dry food helps prevent this issue has it naturally removes tartar and plaque build up due to the kibble's texture being chewed against the teeth. Hypothyroidism is a condition in which the thyroid glands cannot produce enough of the hormone thyroxine, which assists in maintaining the metabolism. Since this hormone is not being produced in a large enough quantity, this condition can result in weight gain along with a fluctuating weight. This condition decreases the amount of blood that is provided to the top of the rear leg bones causing them to deteriorate. Signs of this condition include walking with a limp, which can begin as early as six months old. This occurs when the kneecap (patella) moves out of its normal location, which is in the groove of the femur. While this is common in small breeds, the symptoms can vary based on the severity of the dislocation but it typically includes the hind legs moving irregularly as well as hopping. Since Yorkshire Terriers commonly have sensitive stomachs, it is best to monitor the amount of food they are given daily, what times they are fed and the ingredients listed in their food to avoid symptoms such as diarrhea and vomiting. 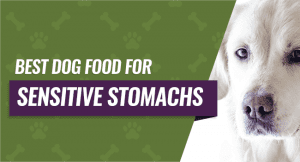 We also have a guide created for sensitive stomach dog foods that may help you. When you purchase puppy food for your Yorkie, there are several factors you want to keep in mind. Your goal is to pick the most nutritious puppy food you can while making it easy for your puppy to eat and digest. Puppies also need a high protein count in their food, whether you choose to use a wet or dry kibble. This protein will help to keep your Yorkie puppy's immune system strong and balanced while giving them energy. 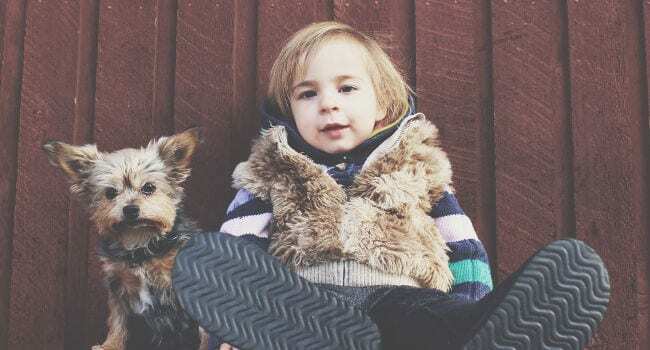 The dog food you choose should also be organic and natural if possible because it can provide better nutritional balance for your Yorkie puppy. Organic and grain-free puppy food is also easier for your puppy to digest because there aren't as many artificial ingredients and chemical components to sift through. Any puppy food you choose should be smaller pieces of kibble if possible because your Yorkie is a small dog, to begin with, but as a puppy, their mouths are even smaller. Smaller pieces will allow your puppy to eat their food comfortably and easily. You should also realize that your Yorkie puppy typically doesn't eat that much food in one sitting, so what they do eat has to have all of the nutritional value they need to stay happy and healthy. This can be difficult because there are so many choices of puppy food available to purchase. We've taken the stress out of choosing a well-balanced dog food for you, and we've combed through dozens of different types of puppy food to find one of the best ones. We'll talk about why we choose this food as one of our favorites, things we liked, and things we didn't like about it. 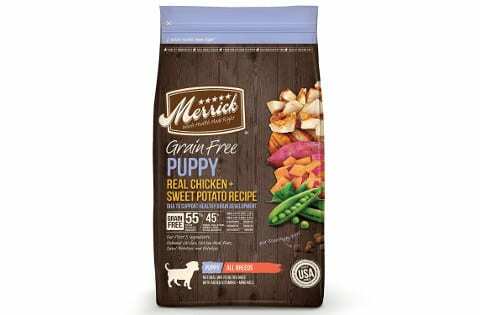 Our pick for the best puppy food for your Yorkie puppy is Merrick Grain Free Puppy Recipe Dry Dog Food. 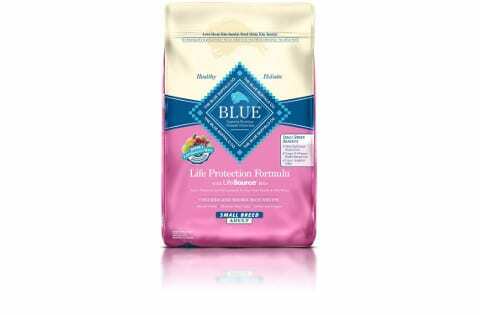 This particular brand of puppy food is good for all breeds, and it comes in a variety of package sizes. This puppy food is grain-free, and this helps to promote healthy digestion, healthy skin and coat, and increased energy levels. It also packs a very high protein value into every serving, so your puppy gets all of their nutritional needs met by eating this food. You'll also find a good level of DHA, and this ingredient helps to promote your puppy's healthy brain development. All of Merrick's puppy foods are made in an organically certified kitchen as well. Pet parents have tried this puppy food and they stated that they noticed an improvement in their puppy's digestion and they didn't seem to have so many loose stools. Additionally, they noticed their Yorkie puppy had more energy, seemed more eager to play, and the kibble was small enough that the puppies had no trouble eating it. As your Yorkie ages, their nutritional needs change, and in order to keep them healthy, you'll have to change their dog food to ensure they get the proper nutrition. 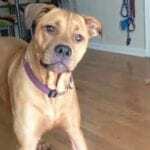 This can be a difficult task because there are dozens of senior dog food brands available, and they all offer something a little different. It is important to note that your Yorkie is considered 'older' when they hit nine or ten years old, while bigger dogs are considered older at around six years old. One of the most significant concerns people with older dogs have is the obesity rates. As your Yorkie gets older and their metabolism slows down, they don't need as many calories per day to stay happy and at the correct weight. You may also notice that your Yorkie's energy level drops as well, and all of these factors contribute to the obesity problem in older dogs. You want a dog food that targets senior dogs, and one that has real ingredients instead of artificial dyes or fillers because this is easier for your Yorkie to eat. A grain-free formula may also be beneficial as your dog will have an easier time digesting it, and it can help to keep them regular. When you're picking out a senior dog food, look for a dog food that has a lower protein count, and that has plenty of healthy fats. Lifestages dog food is a good choice because you won't have to worry about switching your dog over as they age, or upsetting their stomachs. Your senior dog food should have a higher fiber count as well because a lot of older dogs deal with constipation and a high fiber diet can help to eliminate this. 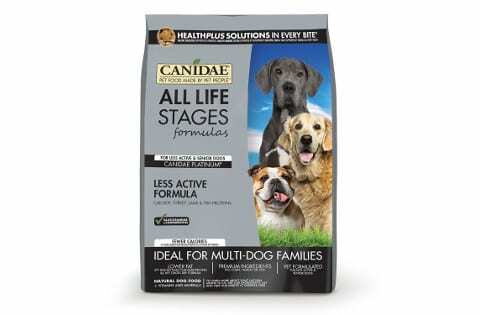 We've compared dozens of dog food designed for senior dogs, and our top pick is CANIDAE Life Stages Platinum Less Active Senior Dry Dog Food. You can feed this dog food to dogs of all breeds and sizes. This dog food for senior Yorkies has 10% less protein and 27% less fat than the CANIDAE All Life Stages Multi-Protein formula. This will help you manage your Yorkie's weight as their metabolism slows down and they become less active. You won't find any corn, wheat, or soy in this dog food's formula, and this is easier for your dog to digest. It is vet formulated especially for senior dogs and any issues they may have. The smaller kibble sizes are perfect for your Yorkie's smaller mouth, and this makes it easy for them to eat. Also, it comes in a few different flavors so you can alternate them to keep your dog happy and satisfied. Fulfilling all of your dog's nutritional needs is critical to ensuring you have a happy, healthy dog throughout their lives. As your Teacup or Miniature Yorkie is a smaller dog, their metabolisms burn at a much faster rate, and they need nutrient-dense food to stay healthy. Additionally, small breed dogs have very small stomachs, and this means the food they do eat during the day has to satisfy their calorie requirements. For example, say your 10-pound teacup or miniature Yorkie needs 400 calories per day to maintain their healthy weight while a 100-pound dog needs 2,250 calories a day to maintain their weight. If you do the math, you'll find that your teacup or miniature Yorkie needs 40 calories per pounds, while the larger breed dog only needs 22.5 calories per pound. If you're not sure, most dog food has guidelines on the side of the bag, or you can always ask your veterinarian. Any dog food you choose should have a good balance of fruits, grains, vegetables, meat, vitamins, and minerals to support their system. Small breeds also tend to live longer than larger breeds, so having a dog food with a high concentration of antioxidants can help to prevent any free radical damage that may occur as your miniature or teacup Yorkie ages. Your dog's food should grow with your dog, and from age one to six you should concentrate on feeding your dog a dog food that offers total nutrition for keeping them active, and once they hit seven years old, look for dog food that promotes healthy skin and eyes, organ health, and one that enhances immunity. Senior dogs or dogs 11 and over should have dog food with glucosamine, vitamin C, fish oil, and Omega-3 fatty acids for improved mobility and healthy teeth, gums, and immune system support. 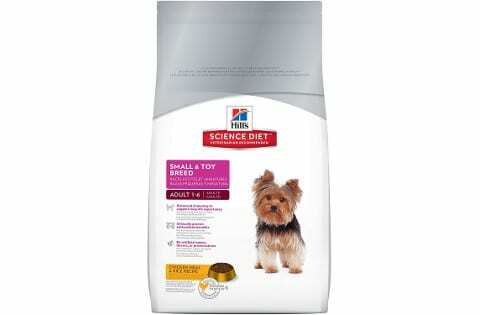 Hill's Science Diet dog food comes in two different flavors and five different stages so you can continue to feed your teacup or miniature Yorkie the same food throughout their lives. This premium formula contains no artificial dyes, flavors, or preservatives. Your dog will get a healthy dose of antioxidants and vitamin C and vitamin E to support and enhance your dog's immune system and to support a long, healthy life. The kibble itself comes in smaller pieces so your dog will be able to eat and digest every serving easily. The ingredients are very high quality, and this includes whole grain, rice, chicken meal, carrots, spinach, vitamins, minerals, high-quality proteins, and antioxidants. This dog food is also made in the United States, and it is held to very high manufacturing standards. You get the choice of several different sizes and optional treats so you can customize your order to suit your needs. This dog food is also the Veterinarians' #1 choice dog food to feed to their own pets throughout their lives. Pet parents who purchased this dog food stated that they noticed an improvement in their older dog's behavior and that they seemed to have more energy. They weren't excited about the price, as it is a higher priced dog food formula. This inexpensive, small breed formula contains high-quality protein sources and carbohydrates to ensure that your Yorkie's needs are meet with each meal. It is ideal for dogs that need weight management which is a major issue for smaller dogs as they tend to overeat and undereat. The kibble is enriched with calcium and phosphorous to help support the maintenance of healthy teeth and bones which are necessary for small dogs as they tend to have sensitive teeth and joints. It also contains taurine for healthy heart and eye function along with Omega-3 and Omega-6 for a healthy coat. This dog food can be fed throughout all life stages, from puppy to adult, and does not contain artificial flavors or colors. Many customers rave that this food is easier on their dogs' stomachs and that it helps to elevate skin issues. A few customers even stated that this formula calms runny eyes. One customer loves the ingredients used in this product but stated that her picky eater dog will not come near the food. The Small Breed Chicken & Rice Formula from Blue Buffalo is an exceptional choice when it comes to choosing food for your Yorkie as it does not contain soy, corn, or wheat, which will result in less digestive issues. Since all the protein does not come from any poultry by-products, that means the chicken is made mostly from the muscle. Blue Buffalo is adamant about using more natural ingredients and does not use artificial colors, flavors or preservatives in their formulas. They add Life Source Bits, a blend of antioxidant-rich ingredients such as blueberries and cranberries, to this formula to ensure that your Yorkie's meal is packed with quality nutrients. This formula is enhanced with flaxseed, an excellent replacement for fish oil. Since it increases Omega 6s and Omega 3s, your Yorkie's coat will maintain a long luster. One customer adores this affordable food as it has helped her dog lose weight and he even enjoys eating it. Another reviewer stated that her dogs enjoy the tiny, triangular shape of the kibble as they are easier for them to chew. A few customers wrote that they had received bags that were torn at the edges when purchasing online. 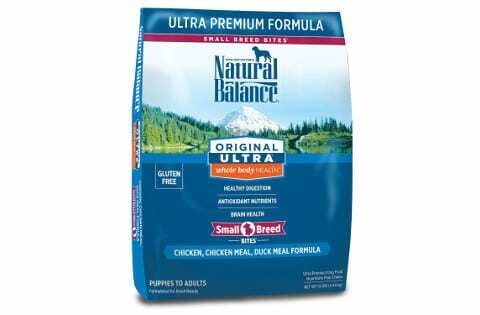 Other customers also reported their dogs have watery stool due to the richness of the ingredients used in the kibble. 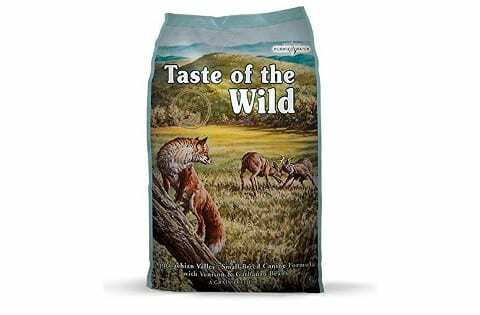 This formula is made with venison, a highly digestible novel protein, along with lamb, egg, ocean fish, and duck and formed into a tiny kibble for your small breed to consume easily. 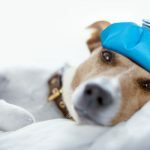 Novel proteins, such as venison, are ideal for dogs that suffer from protein food sensitives as they are not commonly used. Since this food is formulated towards the needs of small breeds, probiotics and prebiotic fiber are included to keep your Yorkie's digestive system healthy. Many customers love this product as their dogs eagerly wait for meal times because they enjoy this food so much. One customer stated that when she opened the bag, the scent from the kibble was meaty rather than chemically like other brands. A few customers noticed that the bags they purchase can be very inconsistent and have caused loose stools. This formula, designed for small breed adults, contains no soy, corn, wheat or artificial flavor or coloring and provides a high source of protein and fat. Brown rice and barley are two healthy sources of carbs used to provide a healthy amount of fiber. Not only is the small kibble easier for your Yorkie to eat, but it also promotes oral health as it can scrape tartar and plaque off his teeth while chewing. This food contains prebiotics, probiotics, and chicory root which is gentle on the stomach while assisting in digestion. 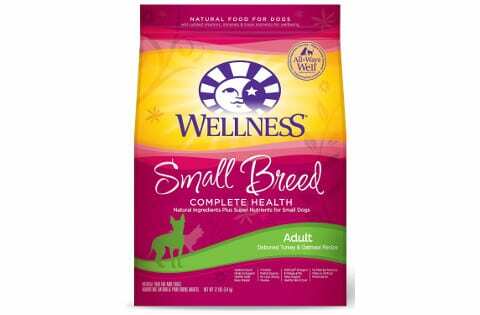 Wellness Complete Health Small Breed is enriched with Omega-3, Omega-6, and antioxidants for optimal immune system health and a shiny, long coat. One customer loves that this product keeps her dog's coat looking shiny and that her dog enjoys eating the food without needed to add in wet food. Some customers claim that this food has helped their dogs lose weight. A customer stated that she noticed quality differences from when she bought this product locally versus online. She stated that the food she purchased from a store was noticeably darker in color and smelled stronger while the product purchased online contained "dust" on the kibble as if she was at the bottom of the bag. Keep in mind that this brand is backed by their Wellness Guarantee which means in cases such as this, a refund or exchange is possible. This premium dog food is grain-free and does not contain wheat, corn, soy, preservatives, artificial flavors or colors, and meat by-products which make it ideal for Yorkies probes to food sensitivities. It also contains live prebiotics and probiotics to assist in digestion. Omega-3 and 6 fatty acids are included to maintain a healthy skin and coat. Real fruits and veggies are used as they are natural sources of antioxidants, which can aid in creating a strong immune system. The high-quality of proteins and complex carbs are used to maintain a healthy weight and provide sustainable energy sources. This formula is enriched with chondroitin and glucosamine which are essential vitamins for healthy joint function. A few customers stated that while it is not the brand's fault, their picky dogs refuse to eat this food. Customers whose dogs happily chow down have reported weight loss in heavier dogs and shinier coats. Overall, Natural Balance Original Ultra Whole Body Healthy Dry Dog Food is the best dog food for Yorkies, if your dog does not have a sensitivity to chicken. Unlike other foods such as Wellness CORE, you are able to feed this food to your dog despite their age. This food is the least expensive yet still contains a high-quality of protein and taurine which supports heart and eye function.